Commonwealth Aircraft Corporation was a state corporation of Australia founded in 1936 that produced aircraft for use in the Second World War. By the time its factories came into production, the war had spread to the Pacific and its aircraft were used in that theater. Models produced included the Beaufort torpedo bomber and the Wirraway and Boomerang fighters. 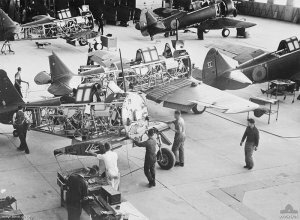 Over 1700 airframes were produced during the war. The chief factory was at Fishermen's Bend, near Melbourne.